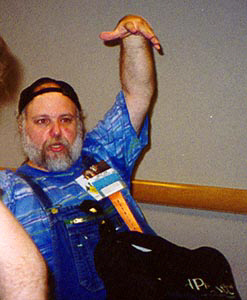 All photos were taken by me, Cheryl Miller (aka Sariel), and I therefore hold the copyright to them. You may not copy any of these photos without my express written permission! Since I took more pictures this year, I'm going to split them up into a few groups. 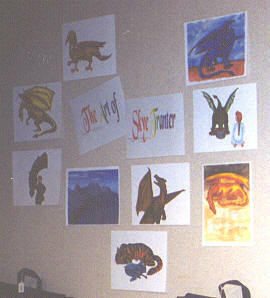 This page holds miscellaneous pictures. Links to the other picture pages are below. Additionally, pictures that pertain to particular panels will be found on the relevant panel summary page; the panel index page will indicate which ones include pictures. 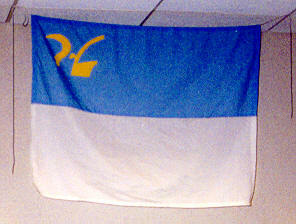 Hanging proudly at the front of the room was the Pern colony flag. 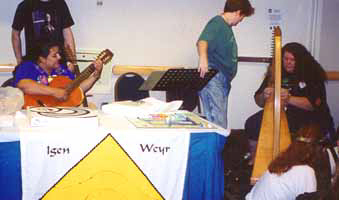 The room was well decorated this year with a plethora of club banners, posters of upcoming Weryfest events, the flag above, and artwork seen here. 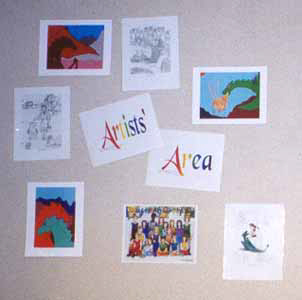 Artists include Julia Struthers and Skye Tranter. 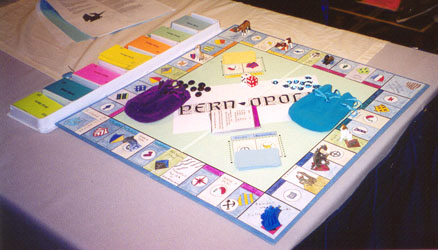 This is one of two "Pernopoly" games created by dedicated fans and displayed on the front table. The sales table this year contained a variety of dragon- and dolphin-themed items. Profits were split between Weyrfest and the fandom club running the table (I've forgotted which club it was!). 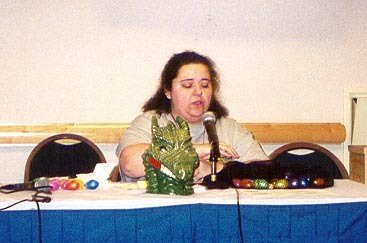 As usual Anna Smith was the director of Weyrfest, seen here choosing eggs for the distribution of door prizes. She loves to have her picture taken... not! She threw an egg at me since I snapped this moments after she'd scolded another photographer. 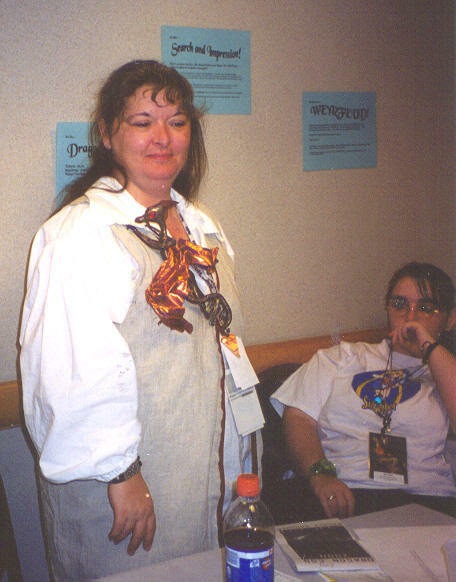 Anna is helped each year by a number of staff members, amongst whom are the Youngblood family. Seen here are Ginny, Heather, and "Uncle Bob." As usual Uncle Bob is heckling Anna. 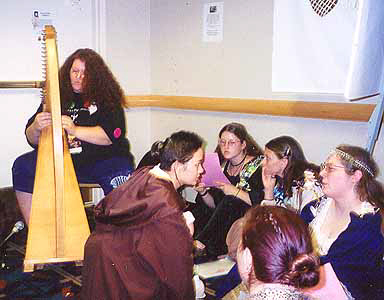 Gwen was back again to provide evening entertainment, and a number of people gathered to listen. Slowly more harpers gathered to play, first Dove, then two others who's names I don't know. 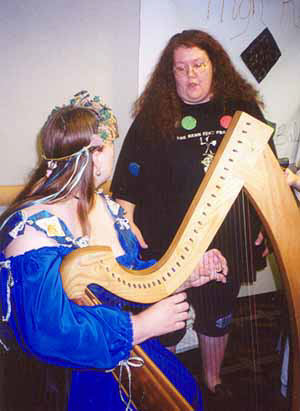 Gwen let Angel try her hand on the harp. 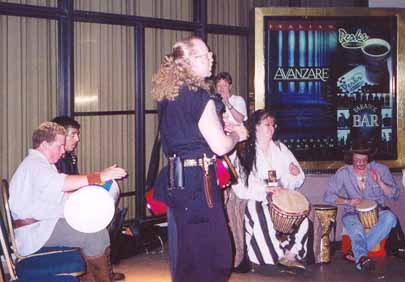 On the back patio of the Hyatt a drum circle formed at night. The subtly varying rhythms were quite compelling to stop and listen to - and for some to dance to!